I vividly remember standing near Halo Crater and hammering this core tube into the Moon. Even though my arm swing was somewhat awkward because of the restricted motion in the spacesuit, I was hitting the target most of the time. 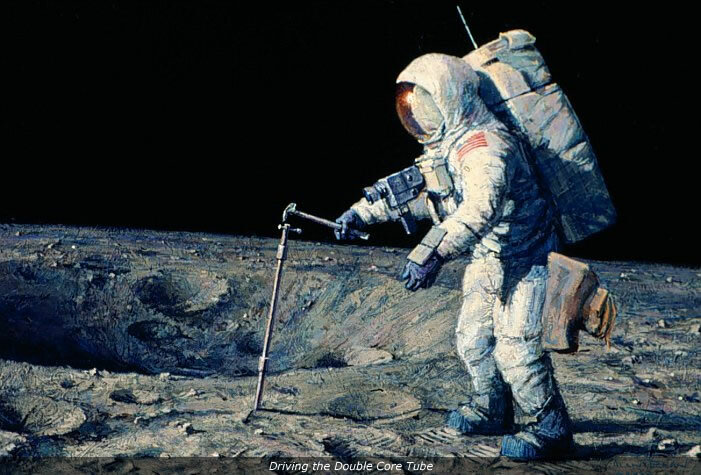 Astronaut Buzz Aldrin had driven two single core tubes on his Apollo 11 moonwalk just four months earlier. Buzz found that the first few inches were fairly easy; then the resistance built up rapidly, preventing further penetration. The bits Buzz used were flared inward 15 degrees, probably forcing the soil to deform and compress as it filled the tube. With a simple modification, our bit had a straight inside wall, the same diameter as the tube. We hoped to go deeper. The modification worked! The driving wasn't easy, but I was able to drive the double core tube to a depth of 28 inches. Later, back on Earth, we would find out that, although there was some change in grain size and color, the granular material remained remarkably consistent with depth. Twenty-eight inches doesn't seem like much as I write this, now, but it took all the energy I had in me to drive that far, back in November 1969, on the Moon's Ocean of Storms.